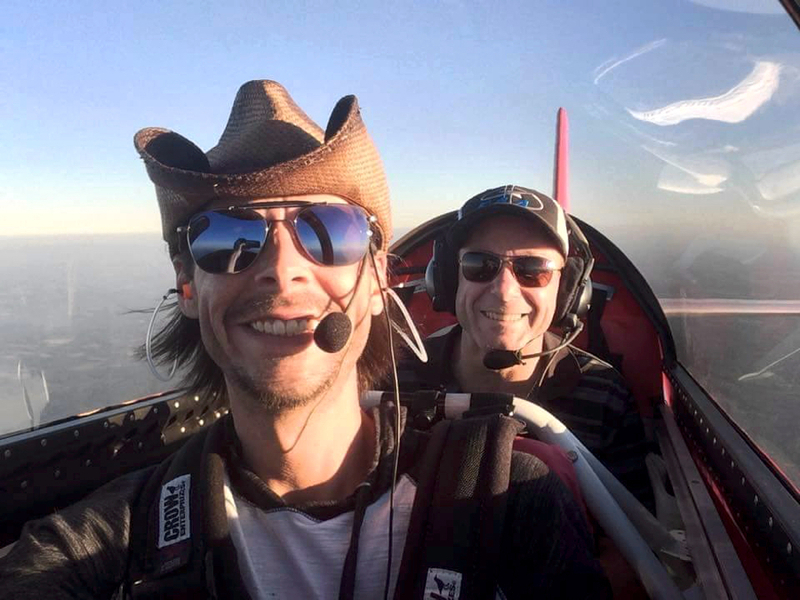 The private pilot and passenger in the experimental, amateur-built airplane were seen flying at low altitude by several witnesses in various locations before the accident. 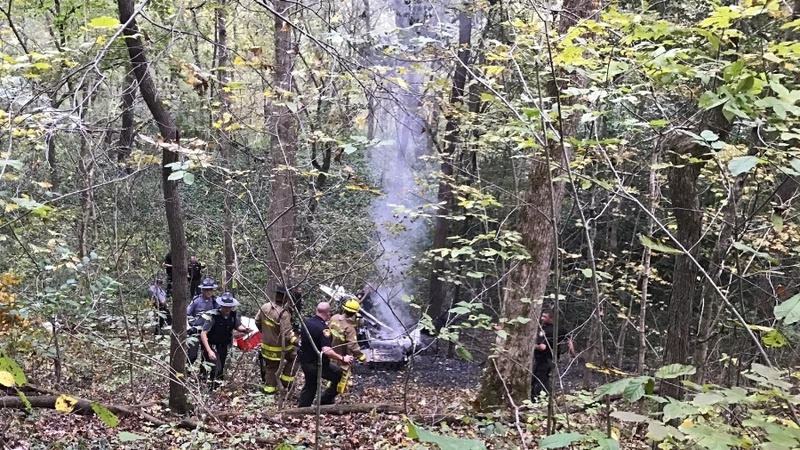 The witnesses reported the engine was operating before the airplane descended into trees. Postaccident examination of the airplane, wreckage path, and a nearby zipline revealed damage consistent with the outboard section of the right wing having contacted the 1/2-inch galvanized zipline cable. There were no mechanical malfunctions or anomalies with the airplane or engine. The cable ran between wooden platforms on the east and west sides of a river about 170 ft above ground level. The location of the platforms in wooded areas and the fact that the cable was unmarked likely made the zipline difficult to see. Witness statements and the accident scenario indicate the pilot operated the airplane at extremely low altitudes throughout the flight. Toxicological testing of the pilot was positive for ethanol and tetrahydrocannabinol (THC, the primary psychoactive substance in marijuana). The blood level of ethanol was below the regulatory limit; however, pilots may be impaired below this threshold. The finding of THC indicated that the pilot had used marijuana sometime before the accident; however, since there is no accepted relationship between blood levels and degree of impairment, whether the impairing effects of THC contributed to the accident could not be determined. The pilot's decision to fly at a low altitude, which resulted in the collision with a zipline. On October 16, 2016, at 1740 eastern daylight time, an experimental, amateur-built Makela RV-4, N2626C, collided with a zipline cable and terrain while maneuvering at low altitude in Oregonia, Ohio. The private pilot and the pilot-rated passenger were fatally injured. The airplane was destroyed by impact forces and a postimpact fire. The airplane was registered to the pilot and was operated under the provisions of Title 14 Code of Federal Regulations (CFR) Part 91. Visual meteorological conditions prevailed, and no flight plan was filed for the personal flight, which originated from a private airstrip in Wilmington, Ohio, about 1708. Several witnesses in various locations reported seeing the airplane flying at low altitude before the accident. Witnesses near the accident site reported that the airplane was traveling south along the river. One witness estimated that the airplane was about 30 ft above the river, and another estimated that it was about 50 ft above the tree tops. Both witnesses reported the engine sounded "strong" and at "full power." One witness momentarily lost sight of the airplane; when it came back into view, the airplane descended into the trees. The pilot held a private pilot certificate with a rating for airplane single-engine land, which was issued on September 6, 2008. The pilot was issued a Federal Aviation Administration (FAA) third-class airman medical certificate on July 17, 2013. At the time of his most recent medical application, the pilot reported that he had accumulated 300 total hours of flight experience, 46 hours of which were in the previous 6 months. On an application for aircraft insurance, dated September 15, 2014, the pilot reported having 750 total hours of flight time, of which 200 hours were in RV-4 aircraft. The pilot's logbook was not located by the National Transportation Safety Board (NTSB) during the investigation of this accident. The passenger held a private pilot certificate with a rating for airplane single-engine land issued on September 29, 2016. He was issued a FAA third-class airman medical certificate on May 12, 2016. The passenger was seated in the rear seat of the airplane, which was not equipped with a control stick at the time of the accident. The RV-4, is a two-place, tandem-seat, low-wing airplane with conventional landing gear powered by a 160-horsepower Lycoming O-320 engine, serial number L-38136-27A. The airplane was issued an FAA Airworthiness Certificate on February 23, 1989. A review of FAA records revealed that the pilot purchased the airplane on June 17, 2009. The airplane maintenance records were not located by the NTSB during the investigation, and the airplane's maintenance history could not be determined. The airplane came to rest in heavily wooded, sloping terrain about 120 ft west of the Little Miami River on property owned by YMCA Camp Kern. The terrain elevation at the accident site was 700 ft above mean sea level (msl). The terrain sloped from about 900 ft on both sides of the river to an elevation of about 650 ft msl at the river, which made a S-shape near the accident site. The trees in the area were about 80 ft tall. Broken tree limbs were visible in several trees near the main wreckage. A path through the trees leading to the main wreckage indicated an approximate 170° direction of flight. All wreckage was in the general vicinity of the main wreckage with the exception of the right wingtip and a section of the right wing just inboard of the wingtip. The bottom surface of the right wingtip was located about 660 ft from the main wreckage just below a zipline cable. The top surface of the wingtip was located about 50 ft from the cable and the outboard piece of the right wing was located between the cable and main wreckage. Examination of the recovered airframe and engine was conducted on October 17, 2016, in a hangar at the Warren County Airport, Lebanon, Ohio. The examination was conducted by the National Transportation Safety Board (NTSB) investigator-in-charge, and Federal Aviation Administration (FAA) inspectors, with the assistance of a representative of the engine manufacturer. The outboard 3 ft of the right wing, including the wingtip, was separated into several pieces. The leading-edge bottom portion of the wingtip was not located. The front side of the right wing forward spar contained impact marks consistent with a braided cable strike near the area where the structure had separated. The outboard section of the right wing just inboard of the wingtip, which was found between the zipline and the main wreckage, contained an impact area that was crushed outboard and rearward. This section contained an impact fold that was about 1/2-inch in diameter. Examination of the airplane did not reveal any anomalies consistent with a preimpact failure or malfunction. A detailed summary of the examination is included in the public docket associated with the investigation. Autopsies of the pilot and passenger were performed at the Montgomery County Coroner's Office, Dayton, Ohio, on October 17, 2016. The pilot and passenger's deaths were attributed to multiple blunt force injuries sustained in the accident. Toxicological tests performed on the pilot-rated passenger were also positive for ethanol and THC. YMCA Camp Kern operates 12 zip lines, 2 of which (designated River 1 and River 2) cross the Little Miami River. The unmarked zip cables are ½-inch rope core galvanized cable. An inspection of the cables was conducted following the accident. The River 1 cable was 1,370 ft long and had a 3.5° slope. The cable ran from a wooden sending platform on the west side of the river to a wooden receiving platform on the east side. Both platforms were located in heavily wooded areas. Two sections of the cable were identified as having been damaged during the accident impact sequence. The first section was located about 486 ft from the sending platform. This damaged section of cable was about 12-18 inches long and contained areas where the cable strands were flattened. The cable was embedded with foreign material and displayed red and green paint transfer. The second section of cable, about 85 ft from the sending tower, contained embedded wood fiber. Tree branches located about 25 ft from this section of cable were broken. The height of the cable at the impact point was about 170 ft above ground level. (b) Over congested areas. Over any congested area of a city, town, or settlement, or over any open-air assembly of persons, an altitude of 1,000 feet above the highest obstacle within a horizontal radius of 2,000 feet of the aircraft. On October 16, 2016, at 1740 eastern daylight time, an amateur-built experimental Makela Urho J RV-4, N2626C, collided with an aerial cable and the terrain in Oregonia, Ohio. The private pilot and the pilot-rated passenger were both fatally injured. The airplane was destroyed by impact forces and a post-impact fire. The aircraft was registered to the pilot and was operated under the provisions of 14 Code of Federal Regulations Part 91 as a personal flight. Visual meteorological conditions prevailed for the flight, which was not operated on a flight plan. The local flight originated from a private airstrip in Wilmington, Ohio, about 1708. Several witnesses reported seeing the airplane flying at low altitudes at different locations prior to the accident. Three witnesses near the accident site reported seeing the airplane flying low just prior to the accident. One witness estimated the airplane was at an altitude of about 30 feet above the river and the other estimated about 50 feet above the tree tops. Both of these witnesses reported the engine sounded "strong" and at "full power." One of the witnesses momentarily lost sight of the airplane and when it came back into view, it descended into the trees.